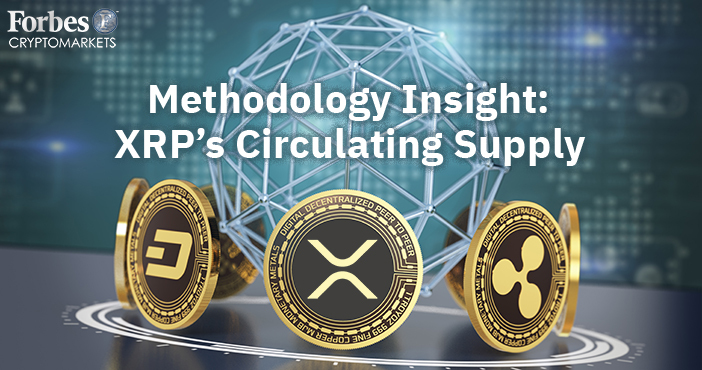 As we received quite a few similar inquiries, this is a further explanation as to how Forbes CryptoMarkets is displaying the circulating supply for XRP. The goal of FCM is to be as objective and data-driven as possible with regard to the information displayed on forbescrypto.com. When talking about market capitalization, circulating supply and total supply, there are some ambiguities when classifying the cryptos' supplies. Traditionally as a financial term, market capitalization is total supply multiplied by the price. Market capitalization measures what a company is worth as valued by the free and open market, which encapsulates the market's perception of its future prospects, because it reflects what investors are willing to pay for each “unit” whether it be a share, token, or currency. Currently, in crypto, “market cap” is widely accepted as circulating supply multiplied by price. This misinterpretation is what has led to the ambiguity and potential apples to oranges comparisons. Additionally, circulation supply in crypto is typically roughly defined as the “float” in the traditional financial classification. The "float" is the number of outstanding units for trading by the general public. The free-float method of calculating market cap excludes locked-up shares, such as those held by company executives, restricted investors, governments or other entities that have clear, defined restrictions on the units preventing them from being arbitrarily released or sold. To restrict sale or trading of units, there must be clear guidelines & legal clarifications. The units cannot be arbitrarily declared “restricted.” The units could just as easily be determined “unrestricted” immediately thereafter. In order to be removed from the circulating supply or float calculations, one needs to know how long and under what circumstances do they have the opportunity to enter the float. Now, this brings us to how FCM is currently classifying XRP, and the reasons behind it: On the XRP website, and in the XRP API, three segments of XRP's supply are disclosed: escrow, undistributed and distributed. All three segments of their supply fluctuate periodically. None of these supply categories are genuinely frozen. There is no clear rules or guidelines as to what, if any, of these buckets are truly or legally restricted. Consequently, based on this, FCM is concluding (for now) that any of these buckets can be available for sale to enter free float at any given time. We are not making any speculative guesses or assumptions beyond that point, as we are actively trying not to inject “opinion” into the determination. Therefore, until we are presented clear contrary evidence, FCM will continue to include all three supply segments: escrow, undistributed and distributed in the total circulating calculation, thus XRP's circulating value on our site may be significantly larger than when compared to some other sites. Thank you to all the readers who have reached out to us on this topic! We appreciate the passion. Our commitment to you, we will always try to be as transparent in our thinking and will respond whenever possible to your observations. @forbescrypto - The latest crypto news and editorial published by Forbes Media.